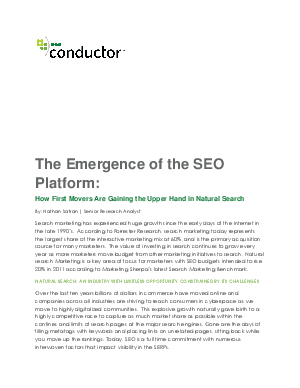 Huge opportunities and technology advances in natural search are compelling search marketers to turn to SEO platforms to gain the upper hand. SEO has long been running to keep up with its digital family but the SEO platform is changing the way SEO is being practiced. The SEO Platform is a software as a service technology that automates data gathering, enables the management of SEO, and provides a workflow and reporting structure to continually improve and show the value of natural search optimization. Easily track rank across multiple search engines for thousands of keywords.